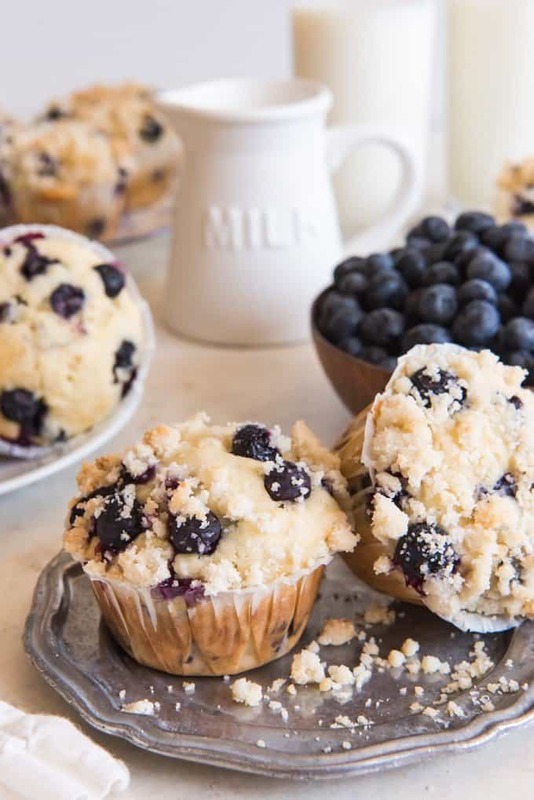 Nothing beats Homemade Blueberry Muffins with Crumb Topping and a large glass of cold milk! 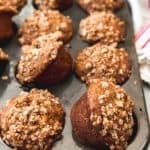 Bursting with fresh blueberry muffin flavor and topped with streusel, these really are the best blueberry muffins ever! Brighten anyone’s day with fresh, homemade blueberry muffins with crumb topping for breakfast or a perfectly sweet afternoon snack. You know the book, “If You Give A Mouse A Cookie”? Well, that’s how I feel about muffins and milk. I just can’t have one without the other! 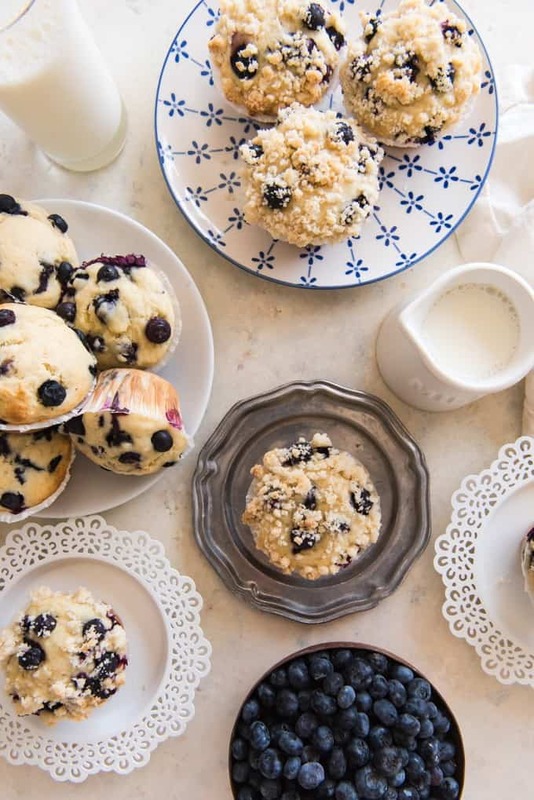 Especially with these homemade blueberry muffins with crumb topping. 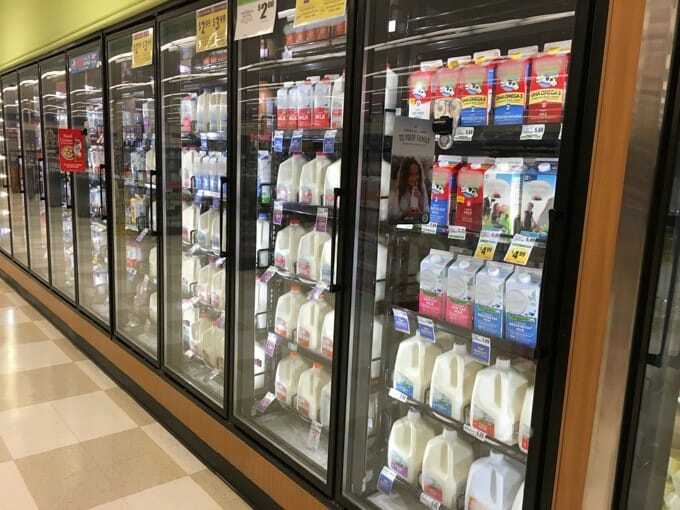 At our house, we go through a lot of milk! Like, multiple gallons each week and there are only 4 of us. It’s always at the top of my list when I’m going to the grocery store. So I’m happy to be partnering with The National Milk Life Campaign today to help spread awareness about the nutrient-rich, delicious, farm fresh beverage with natural protein and no sugar added. We don’t drink soda and we limit our juice consumption, so when it comes to beverage options, it’s milk or water at pretty much every meal at our house! I just feel good serving dairy milk to my girls since it’s just a simple, wholesome drink choice with 8 grams of protein in each 8-ounce serving. 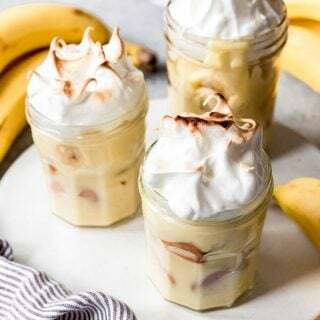 Plus, they love it, so yay for getting the 9 essential nutrients (like potassium, vitamin A, vitamin D, calcium and high-quality protein) that helps them grow strong! And you know if you give a girl some milk, she’s going to want a fresh blueberry muffin to go with it. These homemade blueberry muffins are bursting with blueberries and are so moist and delicious and good! Plus, they remind me of all the breakfasts my mom used to make for me when I was a kid. Now I’m doing the same thing for my daughters, who especially love to help mix up the muffins by pouring in the milk or dumping in the blueberries. 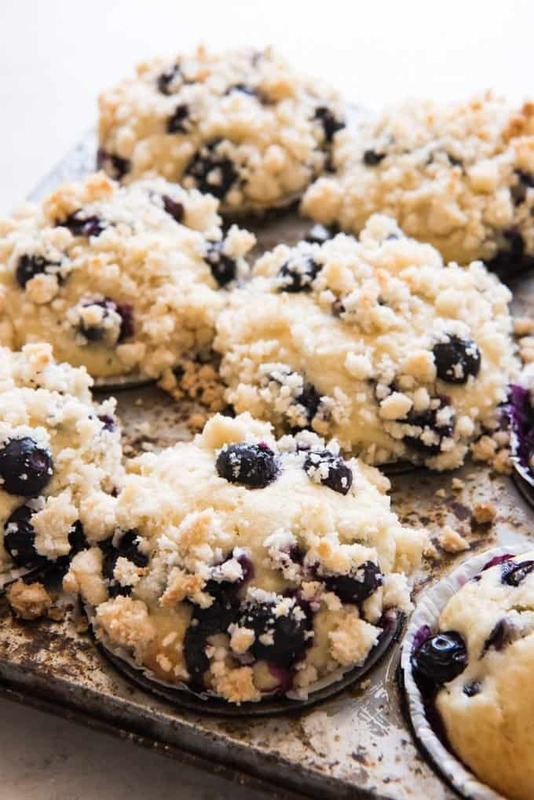 And while plain blueberry muffins are delicious all on their own, adding that crumbly, yummy streusel on top just takes them to a whole other level! They say that simplest is best, and I have to admit that when it comes to homemade blueberry muffins, I believe it. 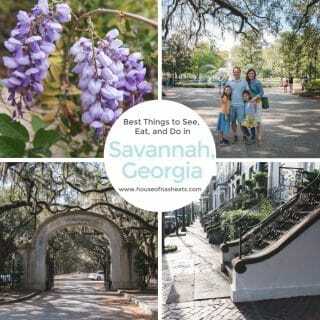 I swear I have tried every blueberry muffin adaptation in the book in search of the perfect blueberry muffin. One that is moist and perfectly sweet without being cupcake sweet and one that isn’t totally fussy. For a while my favorite version was the America’s Test Kitchen one where you made a basic blueberry jam to go in the middle of the muffin, until I decided that was just too much work for regular mornings. I’ve tried making blueberry muffins with sour cream, yogurt, and buttermilk, and while I would generally say I like the direction those approaches were heading, when it comes down to it, my ultimate blueberry muffin is simply made by adding milk as the main liquid, and using half butter and half oil to get the perfect texture and flavor that I want out of perfect blueberry muffins. 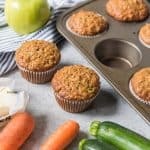 Because these bake in about 22-25 minutes and only take minutes to whip up, I can actually make these muffins for my girls before school. 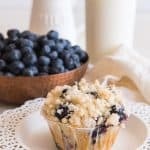 They love them with scrambled eggs and cold milk, and any leftovers get put in the freezer so that I can have blueberry muffins on hand for busier days when we are running short on time. You can make these blueberry muffins with frozen blueberries if fresh ones aren’t available or are out of season and crazy expensive. Just don’t thaw the blueberries first or the juice from the defrosted blueberries will give your batter crazy blue and purple streaks. Either way, be sure to just fold the blueberries in to your batter at the end, rather than stirring them in. 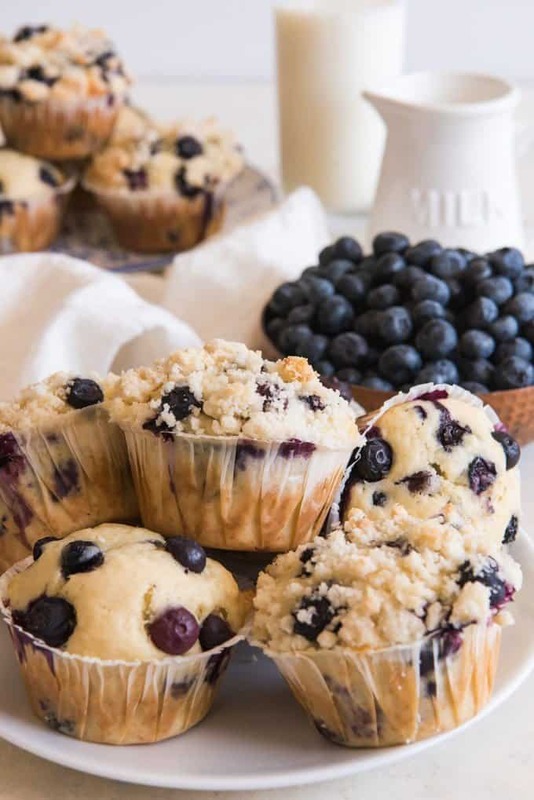 Like any muffin batter, you don’t want to overwork it or your muffins won’t turn out as light and tender and a few folds with a spatula or large spoon right at the end of mixing up the muffins is enough to mix in the blueberries. And I have a secret – I always drop a few extra blueberries on top of each muffin before baking just to make sure the blueberries are visible and make the muffins prettier. Plus, I don’t think you can really go wrong adding a few extra blueberries to each blueberry muffin. 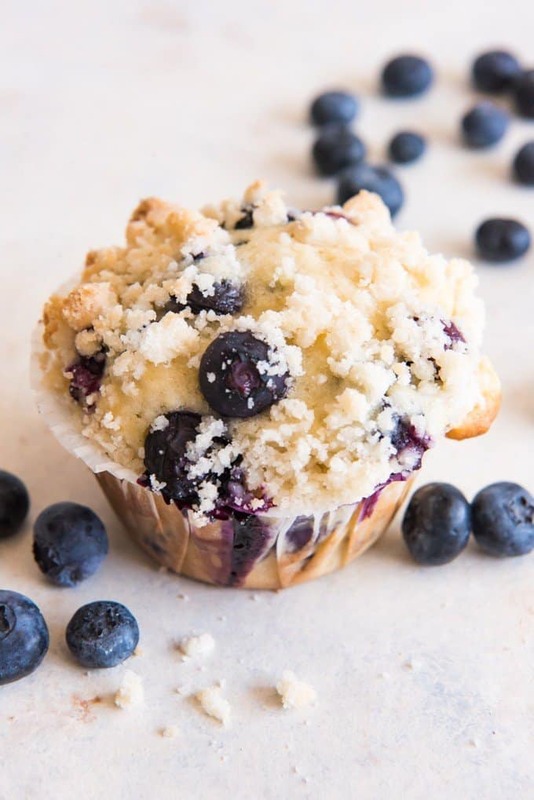 If you want to change up the flavor profile of your blueberry muffins just slightly, you could add 1 teaspoon of freshly grated lemon zest to the muffin batter and 1 teaspoon of lemon zest to the crumb topping for Lemon Blueberry Muffins. Or add 1/2 to 1 teaspoon of cinnamon (depending on how much you like cinnamon) and/or chopped walnuts to the crumb topping for a uniquely delicious blueberry streusel muffin. 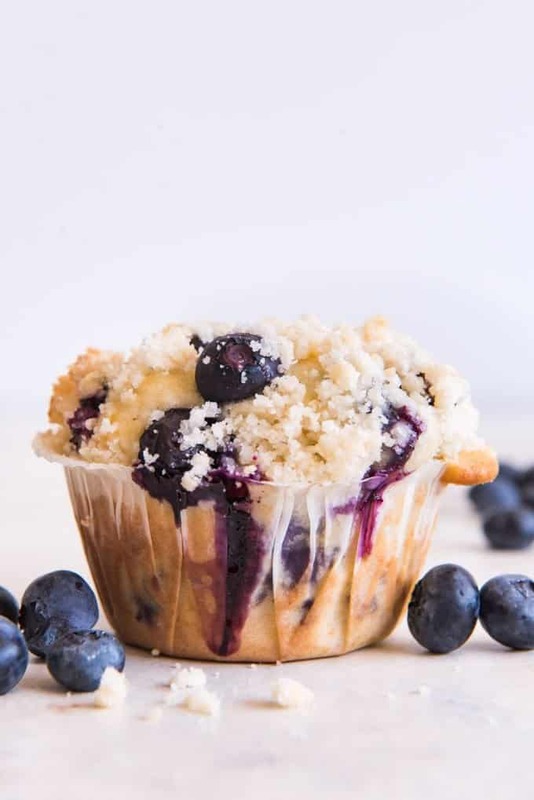 You could also always leave the crumb topping off entirely and just do good old fresh blueberry muffins plain. They are delicious that way too, if you don’t like the extra sweetness of the streusel. 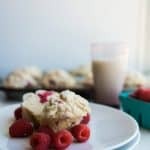 Visit MilkLife.com for more content and recipes to help incorporate dairy milk into your family’s diet! And be sure to follow Milk Life on Facebook and Instagram! 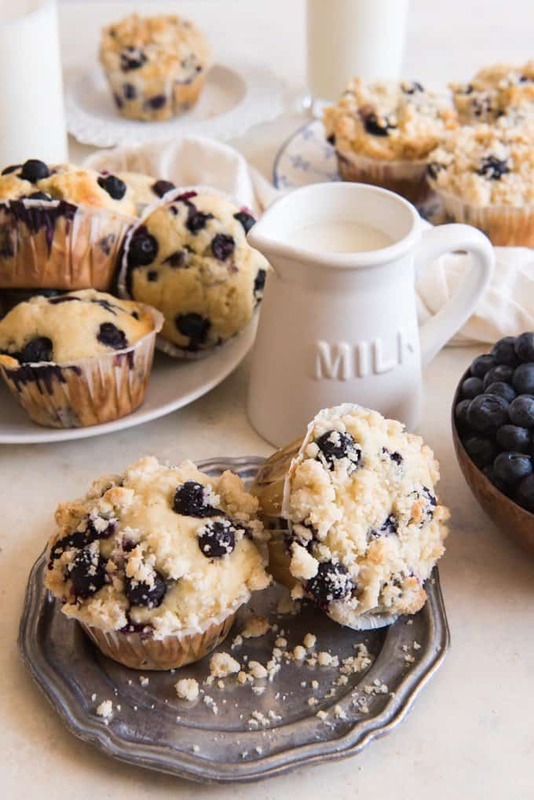 Loving these Homemade Blueberry Muffins and want more muffin inspiration to go with your ice cold glass of milk? Try these! 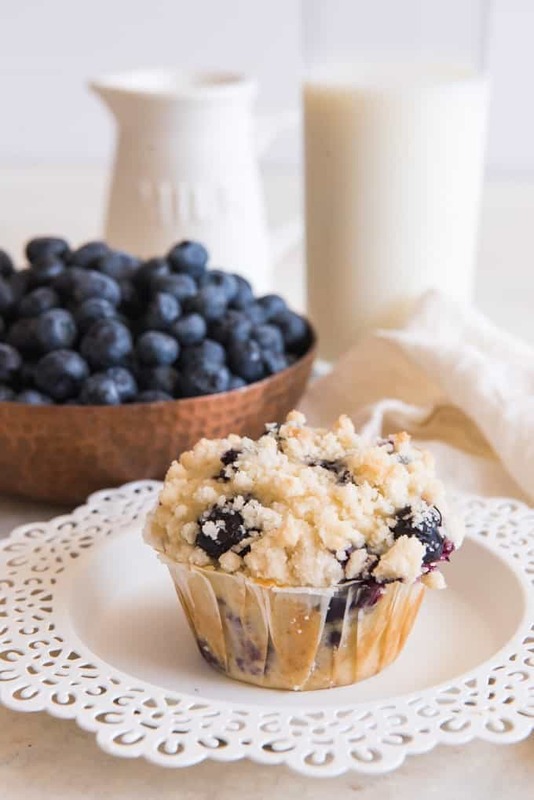 Nothing beats Homemade Blueberry Muffins with Crumb Topping and a large glass of cold milk! 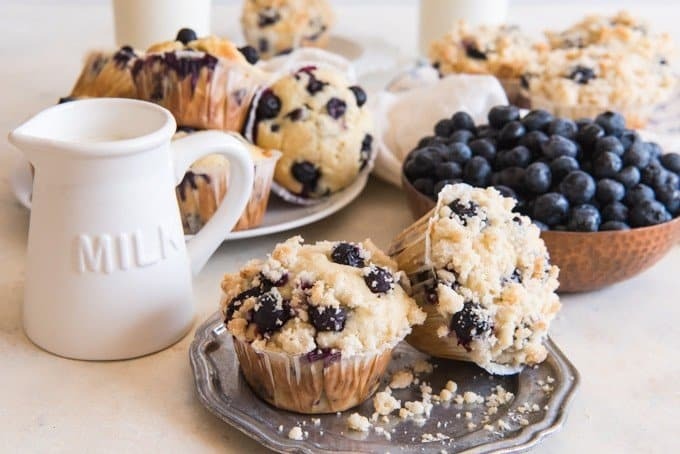 Bursting with fresh blueberry muffin flavor and topped with a sweet crumb topping, these really are the best blueberry muffins ever! You can make these blueberry muffins with frozen blueberries if fresh ones aren't available or are out of season and crazy expensive. Heat oven to 375 degrees. Line muffin tins with baking cups or grease well with cooking spray. 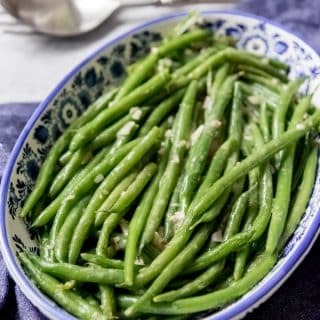 In a large bowl, mix together the butter, oil, and sugar with a fork until smooth. Add the eggs, vanilla, and milk and mix well until combined. Add the flour mixture into the liquid mixture and stir just until most of the streaks of flour are incorporated. Fold in the blueberries, being careful not to smash them. If using frozen blueberries, do not defrost before adding them to the batter. Fill each baking cup 3/4 full, then add a few extra blueberries on the top of each muffin, if desired. 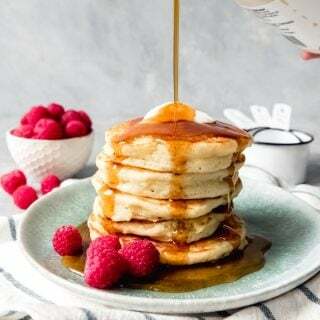 Mix the flour, sugar, salt, and melted butter together in a medium bowl using a fork for the crumb topping, then divide evenly among the muffins, sprinkling about 1 tablespoon of the top of each muffin before baking. Bake for 22-25 minutes, until done. Cool for 5-10 minutes before transferring to a wire rack to cool completely. OMG these look so amazing!!!! Blueberries are my favourite berry. I just picked some up today at the grocery store. These muffins look like my kind of breakfast food. 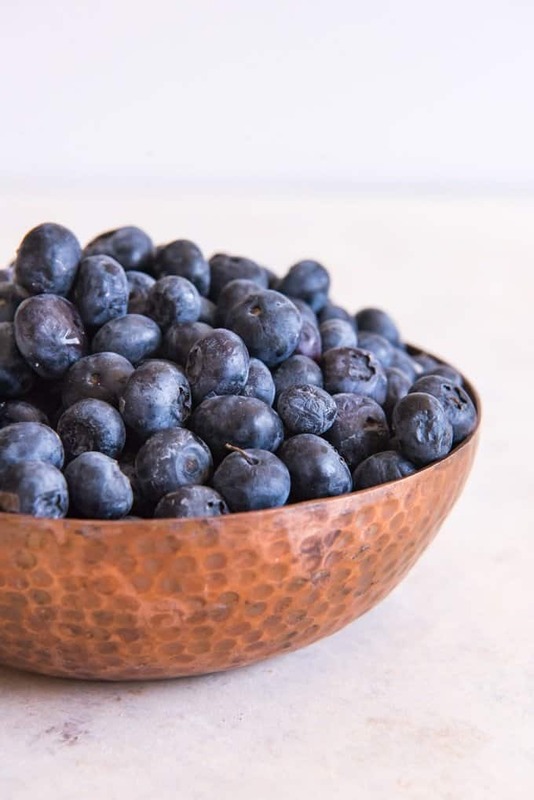 Those blueberries look amazing! This is the perfect on the go breakfast. I really enjoyed buying dozens of pints of blueberries this summer. I love this crumb topping! 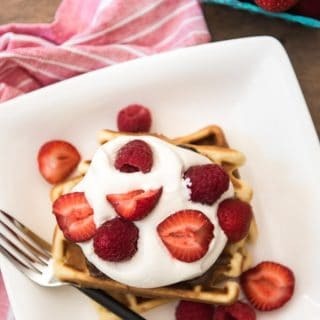 These would go great with my morning coffee. What a perfect little baked treat, awesome that uses fresh blueberries as those are my favorite. 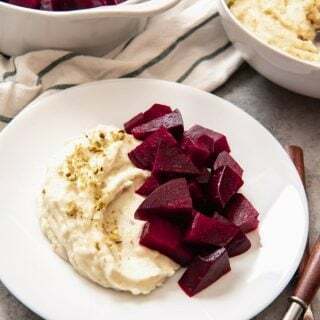 I want to try your recipe soon. Oh, your pictures look so beautiful and these muffins are scrumptious! I love that you add crumbs on top, they always make them taste sooo good! I totally agree with you, nothing beats homemade muffins! Especially if they have blueberry and that luscious crumb topping – YUM! 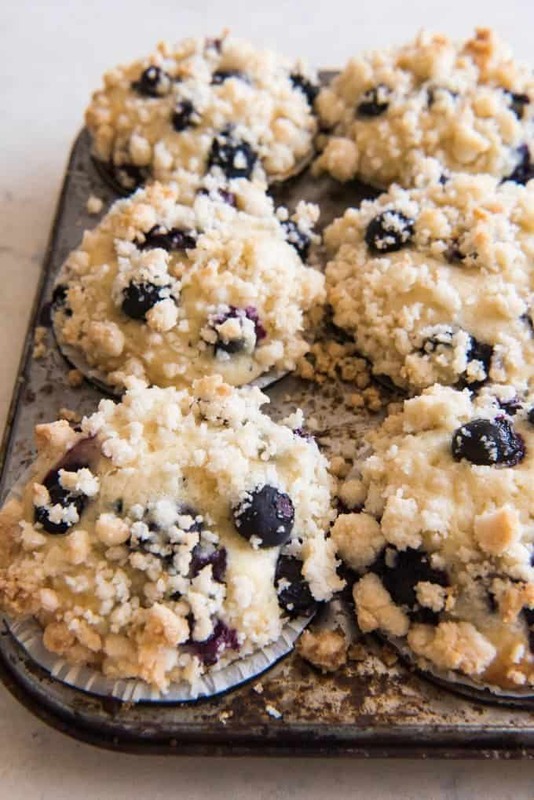 These are perfect blueberry muffins, Love those crumb topping, I am blueberry fan, I need to try this, always muffin with blueberry is a delight. Yes, but I’m pretty casual about it. I just use my finger if it’s mounded after scooping. 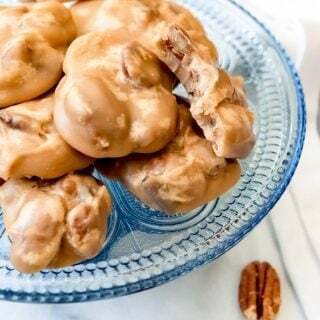 I made these and they were amazing but next time I will make more of the topping. No such thing as too much streusel topping, right?! I made these and followed the directions to a T the crumbs on top tasted like nothing but flour had to cut the tops off ): did I maybe do something wrong? It’s hard for me to say what could have gone wrong, but if you prefer a stronger crumb flavor you could add a little cinnamon to it or increase the sugar a bit so it’s sweeter. I think the balance between butter, sugar and flour is just right for this streusel, but some people like a very sweet streusel top so maybe that could be it for you?